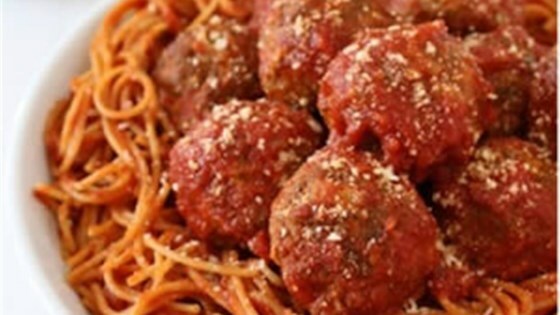 "Baked homemade meatballs are served over hot spaghetti with lots of sauce and grated Parmesan cheese." Preheat oven to 400 degrees F (200 degrees C). Lightly grease a large rimmed baking sheet with olive oil. Combine ground beef, bread crumbs, egg, mozzarella cheese, and garlic in a medium bowl. Use a 1/4 cup measure or ice cream scoop to portion into 12 to 13 meatballs. Place on prepared baking sheet. Baked until browned and cooked through, about 15 minutes. Bring the Ragu(R) Sauce to a simmer in a 12-inch skillet. Gently place the cooked meatballs into the sauce. Simmer 10 minutes. Ladle some of the sauce over hot pasta and toss to coat. Serve with more sauce and the meatballs with a sprinkle of Parmesan cheese. I used this recipe just for the meatballs and they turned out perfect. I will definitely use the recipe again. We made the meatballs exactly as called for and added some onions, garlic and red wine to the sauce. Terrific! I made this today EXACTLY AS WRITTEN! It was great. Sooo easy and GOOD! I used the jar minced garlic - 2 Tbsp and a good sprinkling of Italian seasoning. Easy and quick, but with a very homemade taste! A weeknight home run. Absolutely delicious. Used Longo's Pasata sauce and added my own puree of steamed veggies to give the pasta a lot of flavour. Pinch of sugar and salt. The meatballs are delicious!